It’s time for another Ask DST, where Diamond Select Toys president DSTChuck answers your questions about one topic – except once a month, when he answers all of the other topics! This Miscellaneous Q&A covers Justice League, TMNT, Godzilla, Lost in Space, Buffy, Jurassic Park, Alice: Madness Returns and Ghostbusters! Not all of those are happening, but it never hurts to ask! Read on, then submit your own question by clicking on the form up top, or sending us an e-mail! DSTChuck: I’m doing OK, thanks for asking! We are not allowed to do action figures, Playmates has that handled. However, we do have some latitude with TMNT Minimates, so we’ll have to see where that line leads us. We recently did a Mirage Comics Minimates set for SDCC and for comic shops. I really enjoy your Lost in Space Jupiter 2 bottle opener! It is really more than expected! However, I did notice the alignment of the lower section does not match up to the upper part. An example is the lower window is not directly under the upper windows as it should be. Is there any chance of this being corrected in the future? DSTChuck: Andrew, the sample I have here lines up fine — please contact customer service if you need a replacement. I love DST and my DST series, however one thing that still bothers me are the gaps, particularly of missing key characters in the ‘Buffy the Vampire Slayer’ and ‘Angel’ lines. Is there ever, EVER, a possibility there could ever be a final release for the die-hard fans? I think it’s something that would mean an incredible amount to a lot of fans and collectors. Thanks! DSTChuck: I really think we covered a massive amount of the characters from Buffy and Angel, but a show like that you can never get to every character. For now, we are not looking at producing more figures, but I suppose never say never. DSTChuck: I think Robby would be a great follow up to B-9, so we’ll have to see what the future holds. Hi DST! I was wondering if given the truly phenomenal success of “Jurassic World”, is it possible you guys could create some products for the Jurassic Park franchise? I’ve seen all those made by Kenner and Hasbro, they’re all terrible. They all look like they’re of very poor quality. I think a Select line for Jurassic Park/World would be very successful. Series 1 could be Dr. Alan Grant, Dr. Ellie Sattler, Dr. Ian Malcolm, John Hammond, Dr. Henry Wu and the T. Rex as they appeared in “Jurassic Park”; Series 2 could be Owen Grady, Clarie Dearing, Dr. Henry Wu, Zach & Gray Mitchell and the Velciraptor ‘Blue’ as they appeared in “Jurassic World”; Series 3 could be the Spinosaurus from “Jurassic Park III”, along with InGen personnel Simon Masrani, Ray Arnold, Vic Hoskins and Peter Ludlow – and so on. It’s just an idea of course, but given how legendary the first film is and the amazing success of the fourth one, I think it could be a very successful one. DSTChuck: I think the new movie is great, but it would be very difficult for us to find an area that Hasbro has not covered. It’s a huge franchise for them. For the Femme Fatales line I have a few questions. I am so thankful for the Supergirl Justice League Unlimited Variant of Supergirl & The B/W Haley Quinn. THANK YOU! 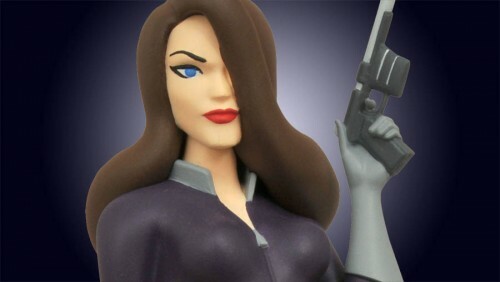 I see that there will be a Talia Al Ghul (Batman Animated) Exclusive. Are there going to be more planned? I would simply Love a Batgirl season 4 PVC statue ( Black Outfit) as well as a Hawkgirl Justice league Unlimited unmasked Jumpsuit Variant. Others I beg you to consider are Phantasm, Black Canary, Huntress, Vixen and for those villainous ladies of DC’s animated section GIGANTA, Foxfire, Killer Frost, Star Sapphire, Cheetah, Roxy Rocket! This more than a fan boy request its also a thank you. I never thought I would ever get a Supergirl Unlimited anything or for that matter a Phantasm mini bust. So if what I saw in those cases at San Diego is it for now I am already Blessed. If there is more to come HECK YEAS! DSTChuck: Mark, hopefully you and other fans have seen from what we have showed at shows that we are very committed to the franchise. I have to be honest, it’s a life’s dream to work on this. I was a small part of the team behind the Rogues Gallery action figure set when I started at Diamond Comics. I think we have shown a solid line-up for all the way to the end of 2016. We have lots of other cool ideas we could do, so hopefully sales are there. We think they will be. DSTChuck: I am sorry, but at this time we are not allowed to make props for Ghostbusters. I loved me some Sliders, but we have nothing planned at this time. Hello DST! I’m loving the Ghostbusters Select figures you showed at SDCC 2015! The fact you are making a Janine is amazing. Egon Spengler was not shown and I was wondering if he is still going to be in the second wave with Venkman? Thanks and keep up the great work with Ghostbusters! DSTChuck: We will of course be doing Egon. We have over a two-year plan for the line and will cover the core team and more. We have not locked down the EXACT mix yet, but I am very confident Egon will be in series 2! DSTChuck: Right now, we are not able to make something like that, but never say never. As time has gone on, our rights to Ghostbusters has changed many times. Any chances of us seeing a re-release of the American McGee Alice figure lines from both Alice and Alice: Madness Returns? The figures are rare and most catch a hefty price when they are found for sale so there is definitely a demand for them. Thanks in advance! DSTChuck: Sorry, I do not think there is a very good chance we will be making more. I am very happy with the lost in space electronic b-9 robot, you people did an excellent job on sound and features. I am praying you do a beautiful Jupiter 2 with lights sound and retractable landing gears and other movable features. I will be the first one to buy one! Keep up the good work! Also, from aliens, I would like to see a marine drop ship and a pc tank! DSTChuck: I suppose a Jupiter 2 is possible, we have tossed around the idea in the office a few times. I think if the sales for B9 are strong, we might consider it. As for Aliens, we have tossed around that idea as well. Hi. Do you guys have any plans for action figures of the upcoming Ghostbusters (2016) movie? DSTChuck: Sorry, our rights are restricted to the classic movies, Bandai takes care of the new movie products. DSTChuck: The Godzilla 1974 bank should be out this fall. We have not planned into 2016 yet, so we’ll have to see. Will we get a toy of Bud and Lou from Batman? DSTChuck: We do not make toys for Batman: The Animated Series, but it could be possible they end up on a statue. DSTChuck: Our license does not currently cover the DVD movies, but never say never! Got a question for DST? Click on the form up top, or send us an e-mail! Next Up: Talia Al Ghul Joins Batman’s Femme Fatales!